Navaratri has come in October this year. When I look back on the celebrations of my childhood and the events that unfold today for the festival is an interesting counterpoint. As a convent going girl, the Michaelmas holidays was eagerly looked forward to. Many times it kind of coincided with the grand festival of Kolu or Navaratri. The New moon day was awaited as that was the day when all the dolls stored away in the attics were carefully brought down. This was the one day that the brawn and muscles of the men of the household was put to good use. Very few homes had a proper ladder and climbing contraptions were assembled—stools, chests, barrels were piled one on another and the pyramid was navigated. The smallest boy was sent deep into the dark bowels of the attic feebly lit by a torch. Slowly, the dolls that had been stored the previous year were brought out. The task was interspersed with yells, scoldings, ‘acchachos’ and expletives like ‘madaya’, ‘rascal’ and ‘blackguard’ as the dolls were carefully or carelessly handled by butter-fingered lads. Many dolls were handed down intact, some with arms and limbs separated from the torso and others with dismembered crowns and heads. Repairs and touch-up paint jobs were hurriedly undertaken and the dolls were arranged according to various classifications. Today the dolls are neatly wrapped in bubble paper, labelled and put away in shallow storage spaces on top of built in cupboard. This has made the movement of the dolls from high to low and vice versa easy and without all the drama and excitement of yore. The male members of the family are also too busy chasing management deadlines that in very few houses they are available to help. The senior citizens are carefully guarded from climbing heights and reaching into higher spaces for fear of injury and broken bones! The next business was to build the steps to display the dolls. The ingenuity of the whole family was brought into play. The trunks, chests, benches, stools, huge biscuit tins, pieces of wood and planks were all put together with geometric precision and the steps built. Lacunas were filled happily with books volunteered by the younger generation. It gave them a valid excuse to skip studying as they could claim that their books were playing a vital role in the religious celebrations. The books that the Gods sat upon were more often old law books, dictionaries, Deepavali malars and science tomes. Steel shelves are now found in every home needing a spanner and a little muscle power to convert them into steps. The creativity and engineering skills have been downgraded. All these make-do arrangements had to be hidden. In those days we had Dhobhis who would take away sheets and dhothis and wash, blue, starch and iron them into a marvellously white blaze of cloth. These were taken out and used to cover the steps, pinned in corners with safety pins or gundoosi. Streamers and decorative crepe paper was twisted and made into chains—a gang was deputed to do this by cutting and gluing strips of paper laboriously—and used to hide the rough seams and jagged ends of the cloth. Today readymade serial bulbs, plastic decorations, flowers, thorans and buntings are bought and hung up in the twinkle of an eye adding colour and psychedelic effects. The dolls were then arranged in the prescribed order beginning with the temporal world of the Chettiars and their grocery shop. The kitchen was raided and all the grains and eatables that would not go bad were brought out and placed in little containers. Then the Saints and mortal beings were placed followed by other dolls depicting characters, incidents and stories from the Puranas. Reaching the top step again called for stools. The books placed as gap fillers would often go awry or shake like aspic in jelly and emergency measures were taken to prop and steady the balance of the steps. The children of the house meanwhile thoroughly relished the prospect of messing around with mud, earth, stones and plants and set up temples on hills, parks and airports, roads and villages and sowed grains that would quickly sprout into grasslands and jungles. Their creativity was given full expression and water, earth, sky and paint and even fire—bulbs placed secretly to illuminate special effects—were used rampantly. Today everything is available readymade, even artificial turf and model villages. Buy, bring and display is the mantra of the day. Beautiful maa kolams were drawn decorating the front yards of homes. The thambulam was filled in paper bags with vettrillai, paaku, turmeric, a little mirror and comb and in some homes even bangles. Little girls in paavadais would be sent off in the evening with a little kumkuma chimizh to invite the ladies in the neighbourhood to come for vettalai paakku. Sundals were made and all the coconuts collected in various homes were converted into barfis to be given off to visitors. Exploring the thambulam bags was an interesting event in the evenings and comments about the sundals served in people’s homes was the topic at dinner every night. Nowadays, rangolis and flower kolams, urulis filled with lotus and colourful flowers form the decoration in the front yards, entrances of homes. Special dates are fixed and invitations are printed and posted or emailed. Fancy bags made to order and special gifts are bought according to a theme and given to guests. Food is ordered and served as high tea and packets of goodies are distributed. The Saraswathi poojai on the ninth day and the Ayudha poojai on Dasami were celebrated with all the books and musical instruments placed in the altar and worshipped. All the vehicles—tricycles, wheelbarrows, bikes, scooters and cars were washed and spruced up and decorated with sandal and kumkum and little aarathi’s were performed. Kids were sent off to music teachers with fruits and thamboolam to pay their respects or begin lessons and a new piece was inaugurated that day. Today the Ayudha puja seems to be on from the seventh or eighth day itself with people doing big poojas in the work place. The rice puff, chana and vellam has become common and distributed generously to all. The Guru pooja has become stylised and ritualistic with expensive presents the order of the day. The ten days come to an end and it is time to put away the dolls. The feeling then and now however remains the same as women wrap up the characters who occupied centre space in their lives for the past fortnight or so. 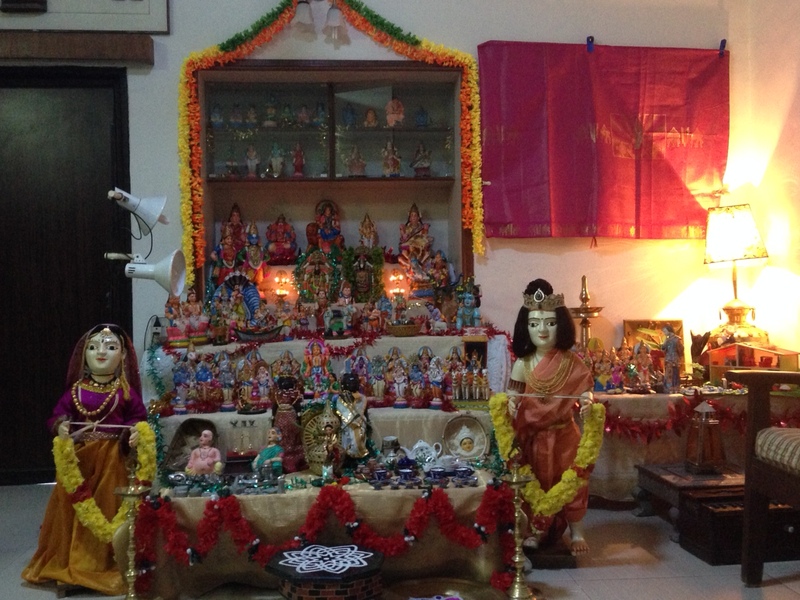 It is a farewell, ‘see you again next year, God Willing’—and Navaratri/Dussera comes to a close. Then and now it continues to be a celebration of family, of community; it is a reiteration of beliefs and rituals that reinforce a faith and way of life. It is the triumph of good and a time of generosity and giving, sharing and festivity. This entry was posted in Current Events, Heritage, Society, Spirituality and tagged attic, books, kolu, Navaratri, steps. Bookmark the permalink.